New GO! 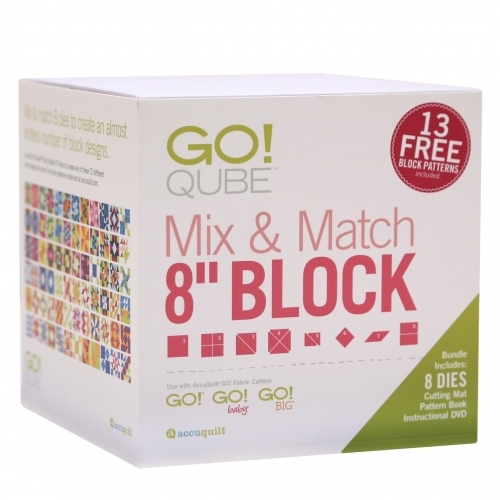 Qube Mix & Match 8" Blocks take cutting fabric pieces to a whole new dimension. Designed to save you time and money, each GO! Qube includes 8 GO! dies, a cutting mat, 13 block patterns, a Getting Started DVD, plus a self-contained storage system. Find out how easy it is to create 8" finished blocks using your GO! Fabric Cutter and GO! Qube ... just add fabric! Most blocks take less than a half hour from cutting to sewing. All Qube orders include a signed Eleanor Burns - GO! Qube Book.